Against the busyness, the tasks, the striving, and the strain the characterize so much of our lives, Br. Nicholas Bartoli offers the radical practice of doing nothing at all. In rest, we discover the stillness at our core. Resting, we can fall into the grace of God. Br. Nicholas Bartoli, SSJE was born and raised in Brooklyn, NY, and is an initially-professed member of the Society of Saint John the Evangelist. 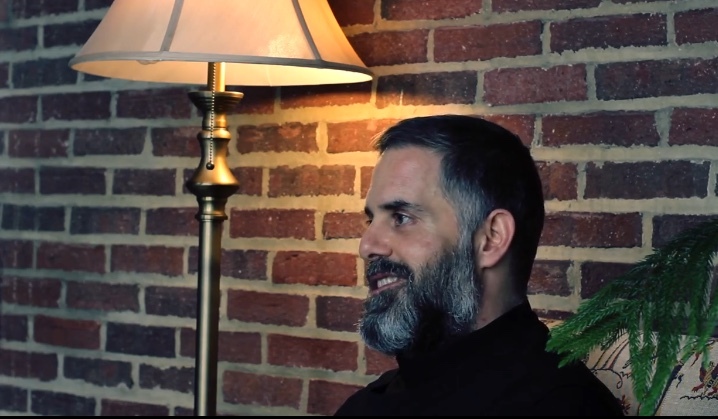 His ministries include spiritual direction, preaching, teaching contemplative prayer, and leading retreats and workshops for individuals, groups, and parishes. He currently welcomes guests at the monastery at Emery House in West Newbury, Massachusetts. Nicholas holds a B.S. in computer science and applied mathematics from Polytechnic University, an M.S. in Environmental Studies from the University of Montana, and an M.S. in somatic counseling psychology from Naropa University. He also has completed two years of an M.Div. program at the Iliff School of Theology. After serving for two years as a Peace Corps Volunteer in Fiji, Nicholas worked in a number of fields: as a high school teacher, IT professional in the nonprofit sector, environmental analyst with Environmental Protection Agency, modern dancer, yoga instructor, massage therapist, and, most recently before joining the Society, a psychotherapist in private practice. There is within us all a very sacred place, a gift of stillness, light, and love central to our being. We could call it our “heart” or “soul” or “the indwelling of Christ.” It’s at once a point of utter nothingness, and the point which gives birth to all things in heaven and on earth. It’s a place capable of holding both incredible beauty and terrible pain. It’s the place where Christ is born, and from whence we can share Christ’s love and compassion in the world. It’s God’s eternal Kingdom within us and our common inheritance as children of light. Against all reason, it’s the place God chooses to call home, and so it’s our home, too. However, it very often seems difficult to even visit this place, let alone claim it as our inheritance and home. We sense its existence most often in a feeling of restlessness, the nagging feeling that there’s something we’ve forgotten or have missed. (The most important spiritual truths often feel like remembering, like a restoration of something lost.) When we start feeling restless or hopeless, we recall our desire for something more: a desire to awaken to God’s loving presence, and to dwell in the sacred place within us that is our deepest truth. As hard as it can be to describe this place, we can become more receptive to it. And the way is truly very simple. I can sum it up in just one word: rest. Imagine this rest like a well, boundless in depth, filled with the profound stillness of the Holy One. From those still waters arise the light and love of Christ. In prayer, with the help of Jesus, we sometimes draw from these waters, tasting eternal life and sensing God’s presence. God’s greatest wish for us is that we simply would let ourselves fall in. (In my experience, God is even willing to give us a push now and then!) Yet a part of us remains wary of the depths, and so we cling to the lip of the well as if our life depended on it. Which is ironic, since the life God wants for us depends on exactly the reverse: our letting go. In our daily lives, we tend to expend an awful amount of effort and energy on not letting go. We constantly try to prove our worth by accomplishing things and being very busy. Or we spend a lot of energy judging other people, trying to prove our righteousness by focusing on the splinter in our neighbor’s eye. Or our effort can be spent jumping from one distraction to the next, avoiding any stillness. This last tactic is especially dangerous in our current culture of distraction, as technology promises to keep us endlessly (mindlessly) entertained — our attention held captive. But God’s invitation remains the same: Just rest. It’s so simple and so transformative. The radical practice of rest can help us to recognize in ourselves the very patterns of effort that consume our energy and our lives. It can help us to let go of these useless strategies and this relentless striving. Rest takes us to the lip of the well, and helps us to fall into God’s generous grace. Rest is something we can practice anytime, not just in formal times of prayer. We can practice it when we’re driving, when we’re waiting in line, when we’re out for a walk, when we’re at work, when we’re cooking or cleaning, anytime really. When we practice rest, we learn a new way of relating to life, just as it is and such as it is. It’s a practice requiring the minimal amount of effort imaginable, like letting a leaf gently fall from your hand. It’s the cultivation of an open and spacious attitude toward ourselves, the world, and God. When we let ourselves rest, we realize God’s being within us, and we awaken to the truth that we are already the peace and joy of the risen Christ. When we let ourselves rest in the blessed stillness of our heavenly Father, we become the hands and feet of Jesus on earth, sharing the light and love of Christ in a world desperately in need of just this. Our prayer, then, is as simple as the practice itself. Please, Lord Jesus Christ, help your beloved servants rest. Please, Lord, grant us rest. To find inner rest, often we must first create outer rest. Each day, set aside a period of time (even if it’s only five minutes) in which you will simply be, not do. Find a quiet space, free from distraction. You might find it helpful to light a candle. Settle yourself comfortably and allow yourself to rest in that spot. Become aware of your breath. Trust that God will do the rest. Choose a sacred word as the symbol of your intention to consent to God’s presence. In a comfortable, alert posture settle into stillness, open to God’s presence. When distracted by thoughts, feelings, sensations, memories, or any kind of experienceuse the sacred word to gently return to simply being in God’s presence. For more information on centering prayer, explore the "further resources" section. What strategies do you recognize in yourself for avoiding stillness and rest? What distractions do you turn to? What keeps you from times of rest? Have you had times in your past when you have tasted the stillness within that contemplatives describe as resting in God? What conditions helped bring you to that place of encounter and awareness? How might you draw near to that inner place again, wherever and however you find yourself in life today? Thank you for the beautiful gift of this reflection, Brother Nicholas. My own understanding of the centering prayer practice I have cultivated was renewed and deepened by your words. Likewise, the tendency to endlessly expend energy hoping to change ourselves and our world–and restlessly evaluating and judging myself, others, and the world in that process–resonates deeply with me. I am immensely grateful for the way you highlight rest’s ability to challenge, change, and transform those tendencies. Thank you. I enjoy the rest I have found in Jesus. 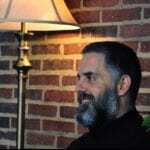 My own centering prayer experiences embrace Brother Nicolas’ concept of resting in God. That space is sacred, known only to Him, and empties me before refilling me with sight and sound and feeling which structure my conscious awareness of God’s presence in my present. Lovely, timely reminder and helpful resources. Thank you. This piece of wisdom arrived in my mailbox just after I and my wife completed a silent retreat on Centering Prayer led by Bishop Gretchen Rehberg of the Diocese of Spokane. Brother Nicholas’ wisdom on rest came as an emphatic “AMEN” to the retreat which introduced us to centering prayer. Thanks to Brother Nicholas and all the brothers for their wisdom. He who dwells in the secret place of the Most High shall abide under the shadow of the Almighty. Psalm 91. What really matters is our relationship to God. Put this first and then and only then will all else fall into place. Thank you for such a timely reminder of the importance of being still and resting in Gods presence. Without this time we work in our own strength and receiving Gods love changes everything. Beautiful. Thank you. And God bless you. Praise the Lord. Thank you for reminding me to pay attention to giving rest to my monkey like mind…..rest from all the worldly noises which create unrest in my mind…..the result of which is a restless mind that can not focus on prayers. Just what I needed to read today as i see fretting over a task. What a blessing to me that your email came today. I have practiced sacred dance (even teaching it at SSJE!) and centering prayer for many years, and four years ago was catapulted into an ongoing experience of the non-Christian spirituality of the Andes that also is about joy and peace and letting go. In addition it is about connecting on an emotional and spiritual level with nature, recognizing we are part of the same energy, a mystical experience that I am reaching for but have not yet attained. I have the great good fortune to have been asked to write a book by the Ecuadorian shaman I have come to know. I have rested in this essay. Thanks you.